I’ve been busy. That’s the short answer. The longer, more detailed answer to what I’ve been up to lately follows. Sometime last year I started outlining the third Alchemancer book, tentatively titled “The Inversion Solution.” I actually completed that outline, then switched gears back to my Assassin Without a Name series because I’m trying to round that one out with a solid ten stories (the story being told in that series will go longer than 10 stories, but 10 seemed like a good number to shoot for as an incremental goal). After spending some time with my witty assassin, releasing The Goddard Affair, Thief’s Gambit, Assassin’s Justice, as well as compiling the first three assassin stories into a collection called The Killing Knife, I changed my focus back to Aaron, Serena, and Ensel Rhe. I did leave them in a somewhat precarious position at the end of The Nullification Engine, so I know it’s important to get back to that series and get the next book out. The problem was that I was not satisfied with the outline. It needed more. So I re-worked it from the ground up. Along the way, I realized there was too much going on to wrap the series up with only one more book, so I decided to add a book four. At that point, given the complexity of the various storylines, I knew I needed to outline book 4 before even thinking about starting to write book 3. I hate writing myself into corners or missing an opportunity for foreshadowing or some other tie-in. Plus, I really needed to work out the details to make absolutely sure I was telling the best story possible. So I pushed through and finished the outline for book 4. With both outlines now finished, I’m poised to finally begin writing the next book. People on my Facebook Page have been asking about it, too, which is kinda nice and cool at the same time. It’s good to know someone out there is looking forward to getting their hands on it. Meanwhile, I also finished the outline for “Witch’s Imperative,” the next/seventh Assassin Without a Name story, and started writing it. I’m about 5,000 words in. The plan moving forward is to split time between the two series, most likely giving more of my time to “The Inversion Solution” simple because it’s going to be longer than "Witch’s Imperative," and thus will take longer to write, and because I know readers have been waiting for it for a while now. Last, I’ve commissioned a very talented artist to create a character illustration of everyone’s favorite witty assassin. I’ve received pencil sketches and some initial color blocks and absolutely cannot wait to see the final illustration. It’s going to look fantastic. The next step after that is to have full illustrations worked up for each of my major series. Think Aaron and Shanna in the middle of a chaotic, elemental storm for The Five Elements or Ensel Rhe and his daughter, Jakinda Rhe, battling a host of skeva for The Nullification Engine. I’d also like to see the Assassin Without a Name with Elizabeth at his side caught in the middle of a host of Jakaree priests. Exciting stuff. The business purpose of these illustrations is to use in advertising, on my web site, and in other promotional capacities, so there is reason beyond the coolness factor. And that’s about it. I don’t write full-time; I’d need to sell a whole lot more books for that to ever happen, so I make use of what time I can outside of my day job. One last parting word... If you’re on Facebook, stop by and like my author page, why don’t you? You’ll get occasional updates like this one as well as other genre related goodies and you can post stuff and ask me questions or just strike up a conversation. I'm very approachable and love to talk to people who share a common interest in all things fantasy. Assassin’s Justice, the sixth story in the Assassin Without a Name series, is officially released! The Assassin Without a Name has a new client and a new job in the form of Kaileesh, a Southlander too sly for his own good. The job goes down without a hitch, but things sour when it comes time to settle. Finding himself at the receiving end of a double-cross isn't anything new for the Assassin Without a Name, so he knows just what to do to Kaileesh. But the situation becomes more complicated when he learns Kaileesh was in league with an influential member of Alchester's gentry. What starts as simple revenge becomes something more as the Assassin Without a Name formulates a plan to bring his own particular form of justice down on the heads of those who betrayed him. This one picks up a couple of weeks after Thief’s Gambit and starts to build a relationship between our witty assassin and a very unlikely ally. Assassin’s Justice is available at all the usual places. Get your copy today. Apparently this is a thing on Twitter. 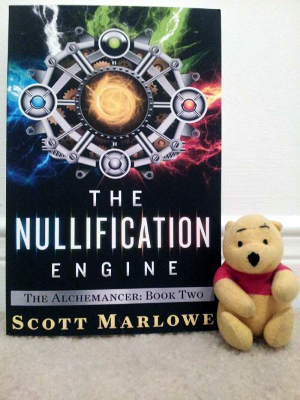 In any case, one of the lucky winners of a recent Goodreads giveaway I ran posted this nice picture of the book she’d won alongside Pooh the Bear. What’s not to like? Thief’s Gambit, the next, fifth, and longest Assassin Without a Name story to date, is officially released! It’s great getting this one out there. I love the direction the story is going in and I love the characters. Thief’s Gambit is a rip-roaring escapade where readers find out why the Assassin Without a Name, well, doesn’t have a name. It’s much more revealing about the character than any of the previous stories, and it moves the overall storyline along nicely as we find out that the Warders, who have seemed benign up to this point, may not have the good people of Alchester’s best interests at heart after all. Elizabeth West, the title character’s love interest and the thief referred to in the title, is back, leveling insults at my main character while making sure he doesn’t get himself killed. The series has been a lot of fun to write and this story, I think, is the best yet. Thief’s Gambit continues the story, but it’s by no means over. The next story is “in process” now, going through initial editing. It’s titled “Assassin’s Justice” and should be out soon. Get your copy of Thief’s Gambit today! I had the opportunity to interview M.C.A. Here are her thoughts. 1. Tell us a little about The Worth of a Shell. What was the motivation behind the story and characters? I've always liked stories about aliens, and am forever making them; they're an eternal lens into questions about the human condition, and give people a way to look at those questions without bringing along the baggage of society and culture that we all drag around everywhere. If I try to write about gender with human characters, I engage all the reader's history with gender in their own life. If I give them a horse-tailed, dinosaur-browed, jack-legged neuter creature, they can leave all that at home. Or at least, that's the hope. When I'm writing about things that are especially fraught for us, I often turn to aliens to explore repercussions that would hit too close to home if written about humans. The Jokka of the Shell universe are a lens to examine multiple issues--not just gender, which is the obvious one, but also questions about dementia and loss. Also, I write aliens because it's fun. 2. Your body of work has a definite anthropomorphic quality. Where does that come from? I think the anthropomorphic quality is literal. I find human qualities in things that are not human, so that we can look at what being human means. My interest is catholic: I like robots, talking spaceships, sentient tree people, were-creatures, aliens, the whole kit and caboodle. If you put it forth believably, I will be entertained! I am fascinated by diversity in experience and outlook. Science fiction/fantasy is a fantastic place to roll around in all that. As a genre, we have a long history of loving our anthropomorphic characters, from Anne McCaffrey's dragons to Asimov's robots to the million talking cat stories (from Niven's Kzinti to Diane Duane's feline wizards to Cherryh's kif from the Chanur novels). We love our non-humanoids! 3. It looks like you waited almost a decade to write Book 2 and 3 of this trilogy. What happened there? Wow, well, all right--so I set up this big problem in Shell, knowing that I would have to resolve it somehow. And according to the rules of epic fantasy, huge societal problems can't be resolved quietly or slowly. It's gotta be nuclear, usually in the form of enormous wars. You have an unjust society, it needs to be overthrown and replaced with something more fair, right? That's how it works, how I grew up thinking it should work, and how, once I started writing, I thought I would have to make it work if I didn't want my readers to feel cheated. There should be banners and cavalry and carpets of armies facing off beneath a cloudy sky, with cold winds blowing everyone's mane heroically from their brows! There should be bloodshed and sacrifice and monuments at the end! And... I couldn't do that with this universe. My first problem being that I'm writing a marginal society: it has so few people surviving in it that a war on the scale of something out of epic fantasy would wipe away the unjust society by rendering the species extinct. Talk about babies thrown out with bathwater! You begin to think of war as a luxury of societies with a lot of either manpower or technology, neither situation of which obtains to the Jokka. My second problem was that I got fixated on having to follow the Chosen One through the entire narrative. It took me a long time to figure out that there was no chosen one, not really... and that the story had to be carried through other people's voices in the subsequent books, because that's where the action was. I'd been wanting to cling to Thenet all the way to the end of the trilogy, but it's not Thenet who gets us through the next important events. Once I let go of those two things, I was shocked how quickly Books 2 and 3 came together. But I'm also glad I waited, because I think the resulting story is a lot stronger--and more unexpected--than the one I would have written had I been bludgeoning myself into writing to the imaginary rules of epic fantasy. 4. What's next? Any current projects or upcoming releases you'd like to share? I just released a high fantasy romance novel, Thief of Songs, which is getting enough good feedback that I think I'll write a second book in that universe. It shares some commonalities with Shell, in that there are multiple genders (in this case, human ones: hermaphrodite and neuter as well as male and female), but it's a much more pastoral setting. In addition, I'm finishing up an epic fantasy trilogy wherein I once again fail to follow the epic fantasy rules--unavoidably, maybe, since I've made a cluster of philosophy students the main characters, and now they want to talk, research, and discuss their way into solutions of problems rather than do the epic stirring battle thing. I hope I eventually do get to write an epic stirring battle! But that year is apparently not this year! Make sure to check out the full selection of StoryBundle Fantasy Author Interviews! Interview with the Author of Sand of Bone!